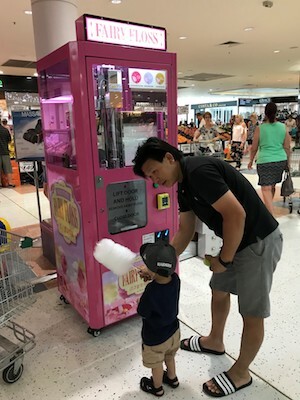 Ray McGowan’s Cashflow Entertainment has secured a deal with a national shopping centre group in Australia for its Fairy Floss machine, the auto-candy floss maker. This now makes four chains of outlets committed to the machine with roll-out beginning in south-east Queensland and hopefully fulfilling around 200 locations for the device. McGowan told InterGame that the latest version of the floss-maker had proved to be of low maintenance and very reliable. Interest was also being shown by FEC groups and tenpin bowling operators. McGowan said that he is now seeking distribution in North America and Mexico to help build up support for the device. The unit is compact (76cm x 72cm) and has a non-stick bowl, lid and vend chamber. The bowl is fully self-cleaning with a brush to clear waste to an external bin – meaning that there is no need to remove the bowl to clean it. There is LED interactive colour change lighting, a new proprietary main board, low-speed floss motor and a dehumidifier keeps sugar waste dry and avoids sticky mess. The spin assembly can be removed and replaced in under three minutes to ease servicing. Cashflow, based on the Queensland Gold Coast, has been an supplier of amusement devices for over 20 years and has considerable experience with the popular chocolate vending machines throughout the country.